I might have been the first one to notice the rainbow which seemed to end in the nearby lake, but C1 (my son with autism) was by far the most excited of us all. He said the rainbow was "painted by God." This is remarkable since we don't attend church much. It was he who noticed that there were actually two rainbows (look hard and you will see it), which is a fairly common occurrence. I was so in awe of the first one, that I didn't see the second, but C1 didn't miss it. C1 notices everything or seems to anyway. It's during these moments that I feel hope. He has had an unusual number of meltdowns lately due to some changes in routine resulting from week long guests and it became overwhelming for all of us. I feel like I'm recovering from a series of war battles. 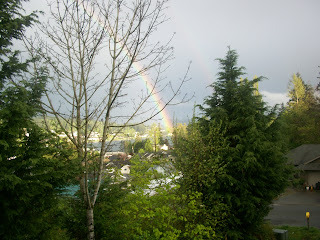 This rainbow and his awesome perspectives about it came when I needed a sign of hope. Things outside of school are not going well. Today I called to get a new pediatrician only to find out that I'll have to call back in May to see if there is any openings for new patients. It's a concern because C1 has health issues that needed to be investigated as soon as possible. We need to see an allergist. We need to see a neurologist. And most importantly, we need to see a urologist and nephrologist. One usually needs a referral from the patient's primary care doctor to get into a specialist. I'm worried about having to wait to get a primary care doctor, so this rainbow is a small source of comfort. Last but not least, I found out about a extended summer program for kids on the autism spectrum only to find out two weeks after inquiring about it that the program is filled to capacity. (But, I was told I can fill out paperwork for next year...) Sigh. I thought that moving to a more urbanized area would be better for us in terms of medical care, services and opportunities. There was a limited number of opportunities in my former and much smaller hometown, but I (with the help of a good friend who also has a son on the spectrum) was able to tap into them without difficulty. Do I need to meet the right person to help me? Do I need to keep trying? How long will it take to get everything that we need? Will C1 suffer from the delay in medical care? there are so many waiting lists for us too. ppl say there is soo much out there for kids with autism to help them but since our nov diagnosis i also have found countless waiting lists and we are still waiting for some real help.